A volunteer, non-profit corporation whose objective is to sponsor and promote the development of track and field in the Lane County Metro area. For more than 50 years, the Oregon Track Club has had a big part in building the TrackTown USA brand. 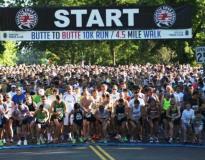 They host many community events such as; the Prefontaine Classic, the Butte to Butte race, the Hayward Classic and they are a sponsor for the Eugene Marathon.